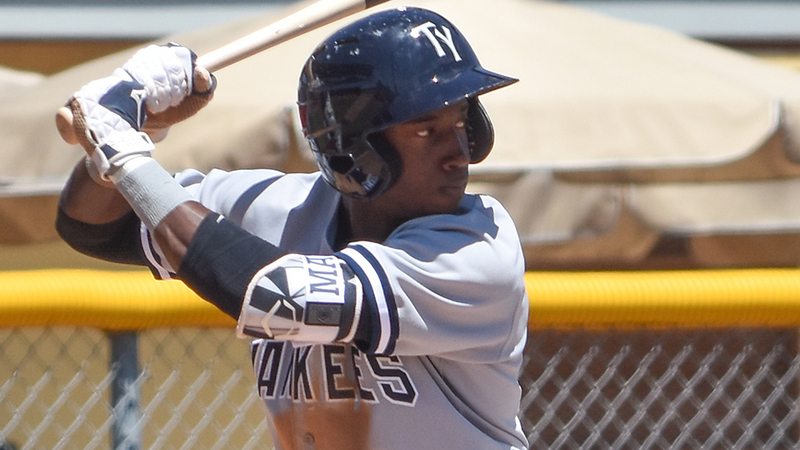 Top Yankees prospect Jorge Mateo has been suspended for two weeks by Class A Advanced Tampa for violating team policy, the club announced Wednesday. Mateo is slashing .266/.323/.396 in 76 games in his first full season in the Florida State League. He ranks second in the circuit with 26 stolen bases in 38 tries, fourth with 46 runs scored and sixth with 122 total bases on the strength of 22 extra-base hits, including five homers, eight triples and nine doubles. The native of the Dominican Republic was named to the World team for the All-Star Futures Game on Sunday but will not participate, according to several reports. Mateo signed with the Yankees for $250,000 in January 2012 when he was 16 years old. The 6-foot, 190-pound shortstop made it to Class A Charleston at the beginning of last season, slashing .268/.338/.378 with a Minor League-leading 71 stolen bases before moving up to Tampa, where he went 4-for-6 with 11 steals in his Class A Advanced debut.